You’ve probably noticed by now that I haven’t posted a single recipe since late November. The one lonely post that was delivered was a response to Margaret Atwood’s seemingly-prophetic novel, The Handmaid’s Tale. That’s because, try as I might, I can’t seem to get back on the track I was before. Everything pales in comparison. Everything seems petty and trivial. I’m late to the realization, but I’m aware now, and it’s so hard to unsee what I’ve seen–it’s impossible to go back to the person I was before. It seems so simple. It also seems like something that should have been figured out long ago, before I was born. 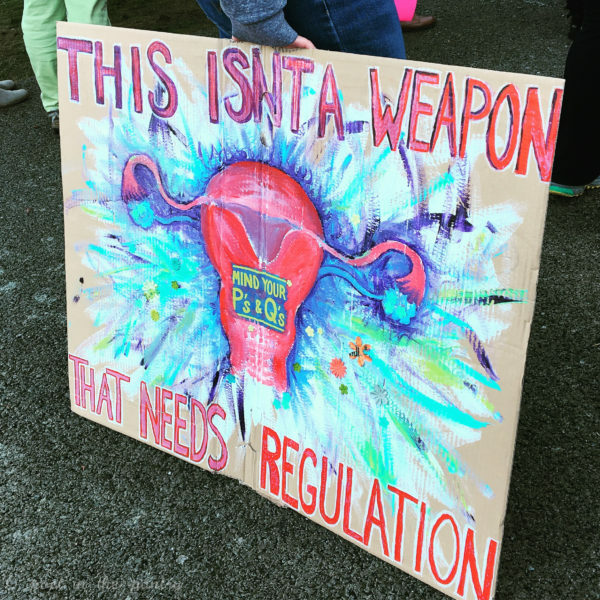 Roe v. Wade has been the law of the land since 1973; I’ve only been around since 1977. But here’s the interesting thing: it’s when you start taking things for granted that they become all the more likely to be destroyed. 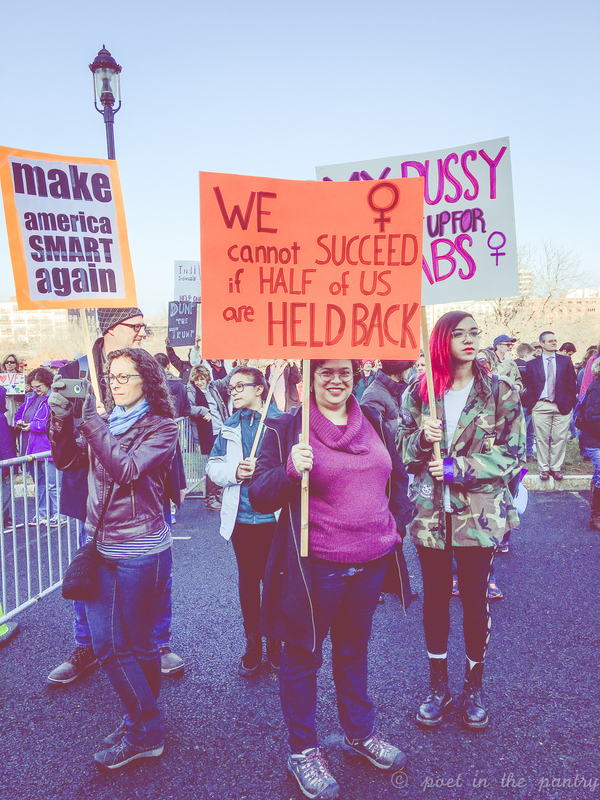 The new administration is decidedly anti-woman. Anti-gay. Anti-lesbian. Anti-trans. Anti-black. Anti-brown. Anti-immigrant. Anti-community. Anti-arts. Anti-humanities. Anti-science. Anti-education. Anti-logic. Anti. Period. That’s a lot of negativity swirling around. And while it’s easy to be swept up in anger, stewing as you sit in your computer chair late at night, cast in the glow of a Twitter feed that raises your blood pressure with every tweet discharged, lobbed over the internet wall like little hand grenades meant to divide and conquer, that does nothing. Nothing. Sometimes, it’s all so overwhelming. I get that. I have a hefty dose of social anxiety on my plate. The telephone can seem to be 50 feet tall at times, threatening to crush me if I attempt to pick it up. The mission so massive that my little voice–my small contribution–means nothing at all. A mere drop in the ocean. But that’s not true at all. I now realize that my lifelong pursuit of allowing our elected officials a free pass to do as they will, unchecked by the people who put them in those positions of power, is unsustainable. It was idiotic to place that kind of trust in others. While I relied, in the past, upon their experience, their wisdom, their intelligence, their purported good intentions, I now know that you can’t rely on the fact that these “leaders” will possess any of these qualities. And while some in the past have already proven that to be true, the danger didn’t seem as real then as it does today. I’m 39 years old. I finally know better. 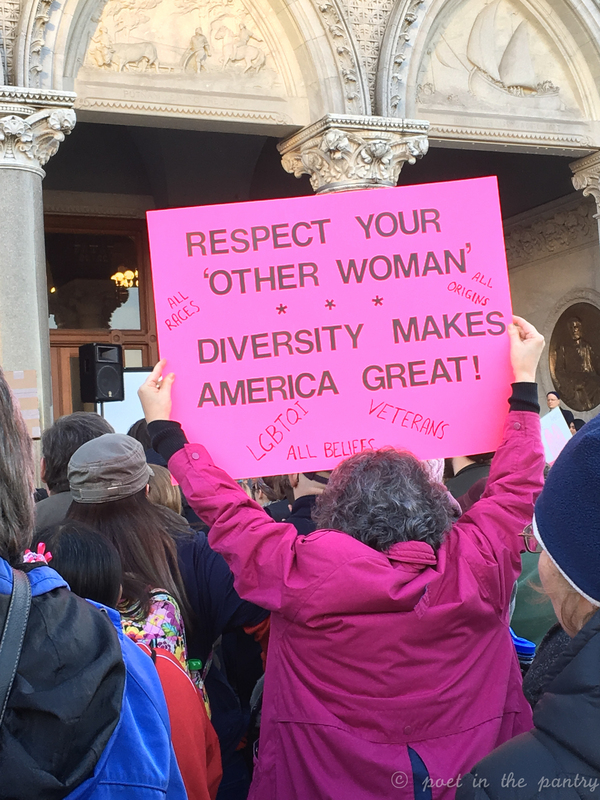 Yesterday, I attended the Women’s March on Hartford rally in solidarity with the March on Washington. I wanted to be in Washington. I believed it was important to make those numbers as huge as possible. To be a part of the big march. That it was the one that mattered most. 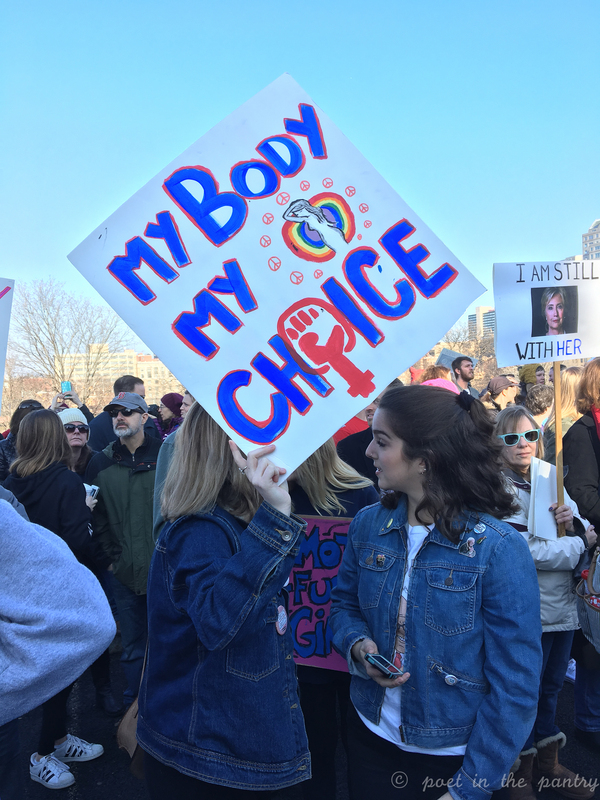 But I couldn’t make it happen financially, and then, when I had planned on taking my feet to the NYC Women’s March, one of my feet put the kibosh on the whole thing with a massive blister that developed during a prep walk, swelled to great size, and unhooded–all in 30 minutes. Raw and weeping for days, I knew I would not be able to stuff my feet in shoes and take them to the streets. 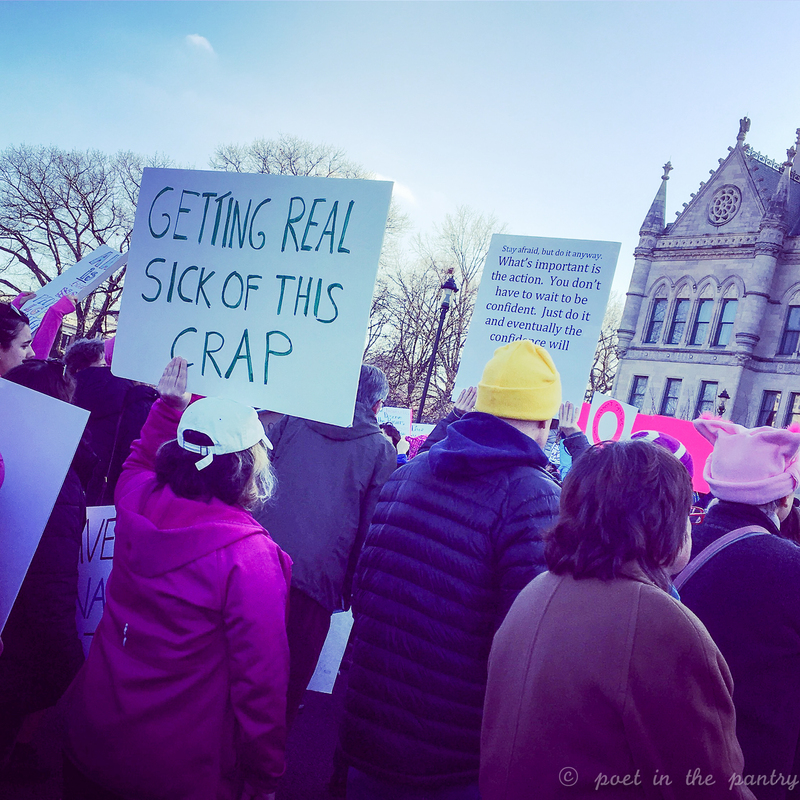 As pain kept me up most nights, managing to cobble together no more than 4.5 hours of sleep per night, I made the decision that I would rally instead. I could have easily given up. I could have stayed home, anticipating that there would be plenty of others there–that no one would notice one woman who didn’t show up. 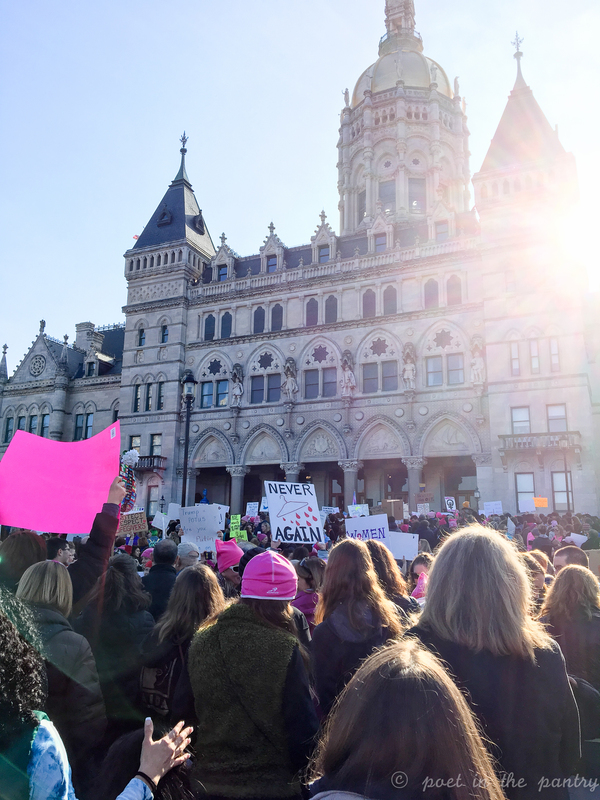 But yesterday was the day for showing up, and I did–and brought my daughter with me. The reason why I am so frightened for our future. Crowds scare me. Heck, Hartford scares me! Somehow, NYC seems so much more…hospitable. We arrived early, worried that parking would be limited. I’ve lived in this state my entire life and I still don’t know my way around our capitol city. I avoid it like the plague. But I found the parking garage we intended to utilize, parked, and we walked over toward Bushnell Park–also a first for me. As we waited in line in Sarah’s Coffee House for a quick caffeine infusion, I noticed that we were not alone. 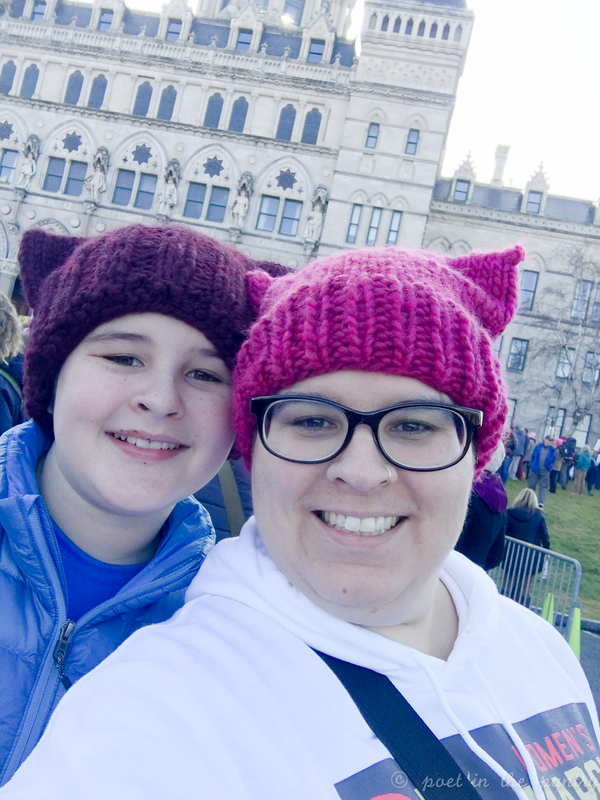 Pink pussyhats donned some heads. Signs were propped up on tables and walls. Men and women surrounded us who were clearly supporting the cause. Smiles erupted on faces of strangers, some shy, others bold. All united for the same reason. 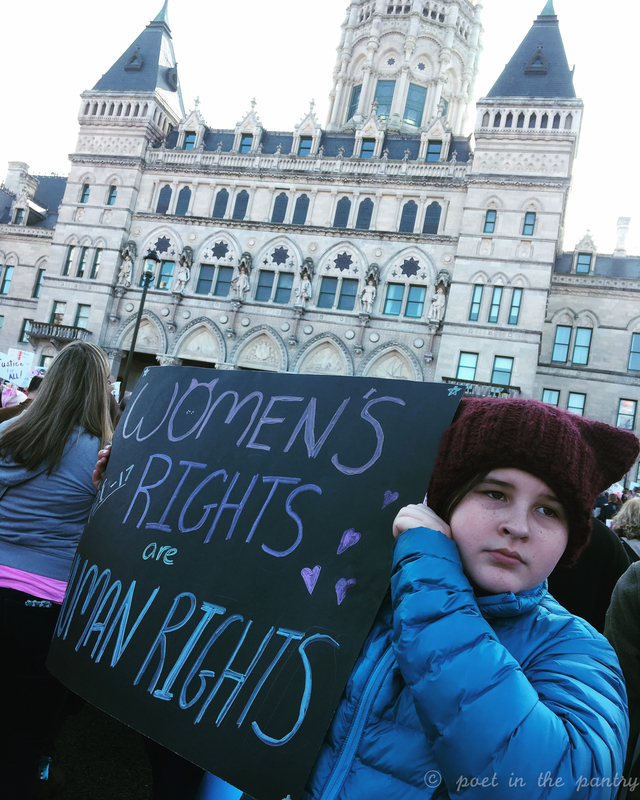 Mags and I encountered more of our fellow marchers as we made our way to the capitol building. So much energy was building already. 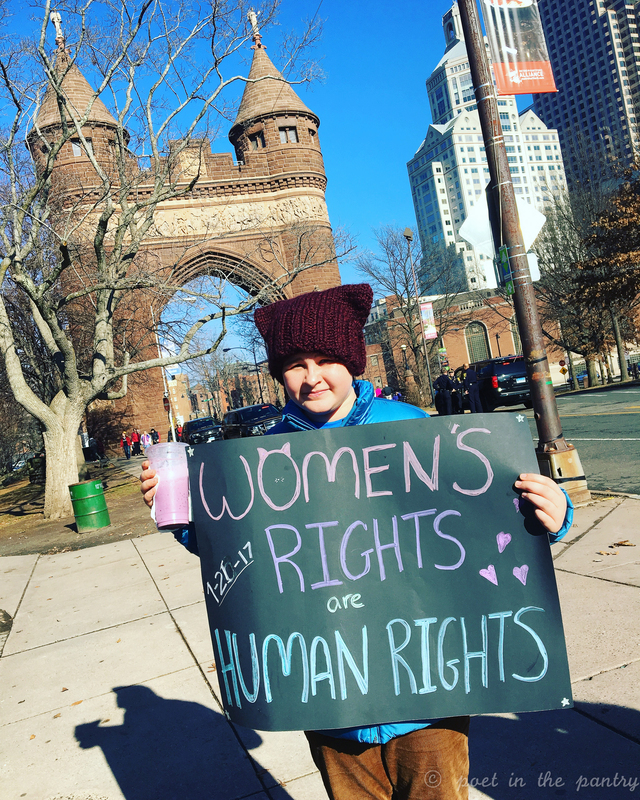 I was taking a photo of Mags with our sign at the arch when a young woman stopped to compliment me on my own pussyhat and asked where I bought it. I beamed as I told her I made it myself. That, in itself, was quite the accomplishment, seeing as I only managed to knit simple scarves before this week. 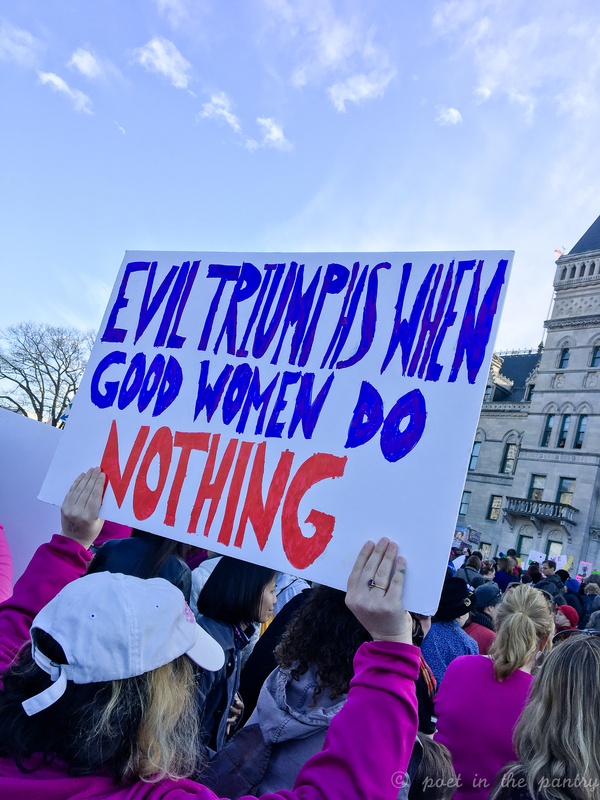 Yet I forced myself outside of my comfort zone, spending my sleepless hours convalescing knitting six different pussyhats–one of which was worn proudly in Sacramento, CA yesterday. 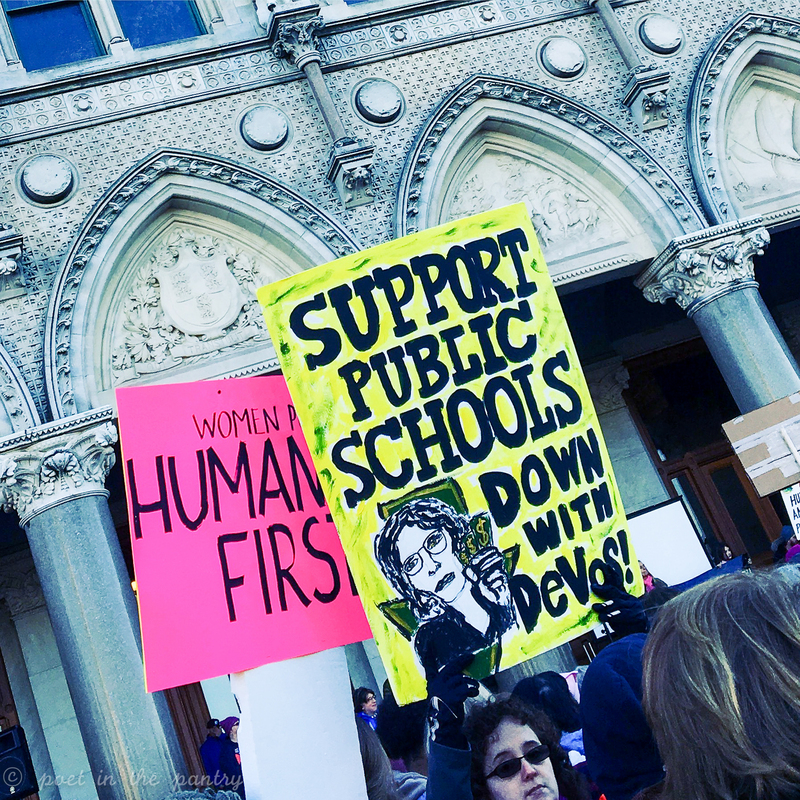 We arrived at the asphalt parking lot in front of the capitol building steps to a sea of signs. I snapped quick photos of them, to preserve the memory. Friends met friends. Families stuck together. 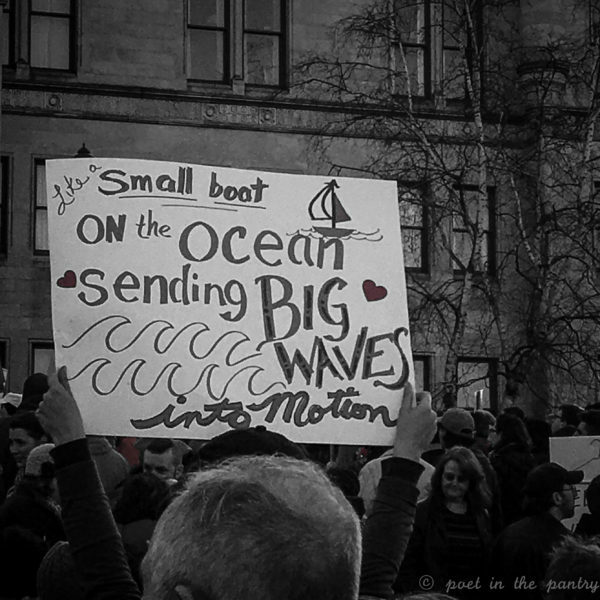 Even little ones were dodging legs, a part of this momentous occasion. The crowd continued to grow, composed of men and women alike (and, as speaker Helga Mann put it, “those in between”). Muslim, Jewish, Christian, Pagan, Atheist. Black, Brown, Yellow, Red, White. 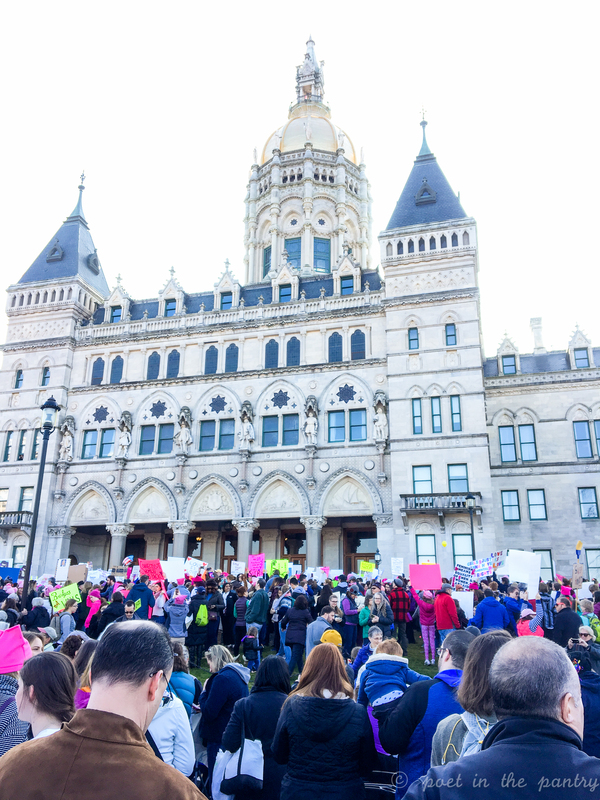 In numbers that swelled eventually to more than 10,000, according to Deputy Chief Brian J. Foley of the Hartford Police Department. 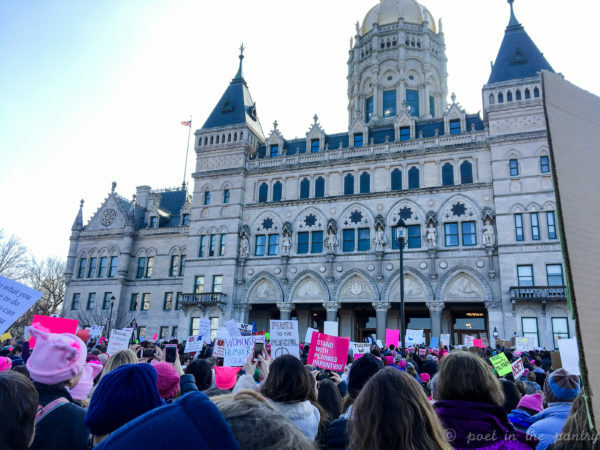 The Women’s March on Hartford wasn’t as grandiose as Washington D.C. or NYC, for sure. 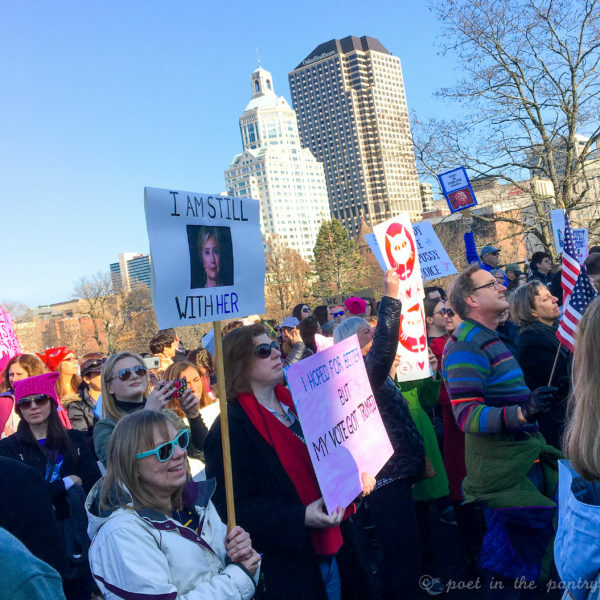 But it still mattered, as did the more than 600 other sister marches held all over the world. It was a moment for solidarity. For unifying. For focusing. But the real work? That begins today, and will last forever. Because I am now aware. And I can’t go back to who I was before. None of us can. That’s why it’s so important that we ensure the new administration doesn’t force us to. knowing, really, truly, absolutely, that I am not alone. This was a great post! Thanks for sharing your view of the event! Excellent “to do list” (ways of getting involved) at the end! 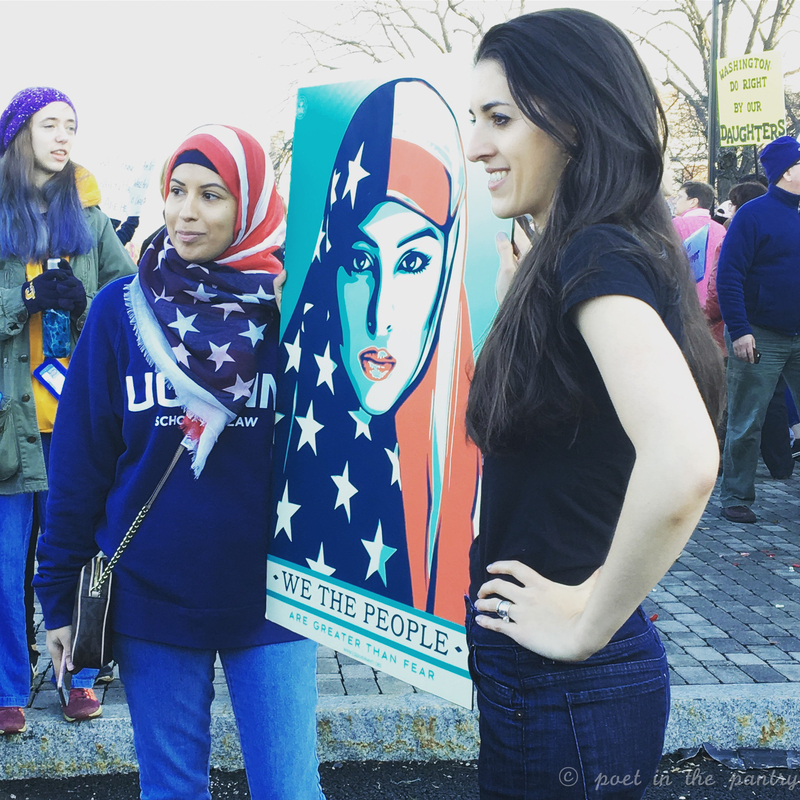 Thank you so much for being brave, jumping out of your comfort zone and beautifully documenting the solidarity and passion of this Women’s March. Your honesty is so appreciated…I think we all feel this way. Overwhelmed, disgusted and scared. Thanks also for sharing links on doing more and getting involved. It’s vital right now. Looking forward to checking off my 10 actions…and for 2020. Hugs. Hi, Thank you for writing such a thoughtful piece! 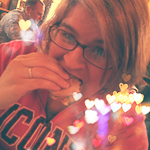 My sister is in a couple of the pictures you posted—would it be okay if I used one of the pictures to celebrate the 1 year anniversary on instagram? As long as you provide photo credit, that’s awesome. Thanks for asking!